Earth's upper atmosphere is partially ionized due to the absorption of solar ultraviolet rays and X-rays and the impact of energized particles. The ionized atmosphere is called the ionosphere. 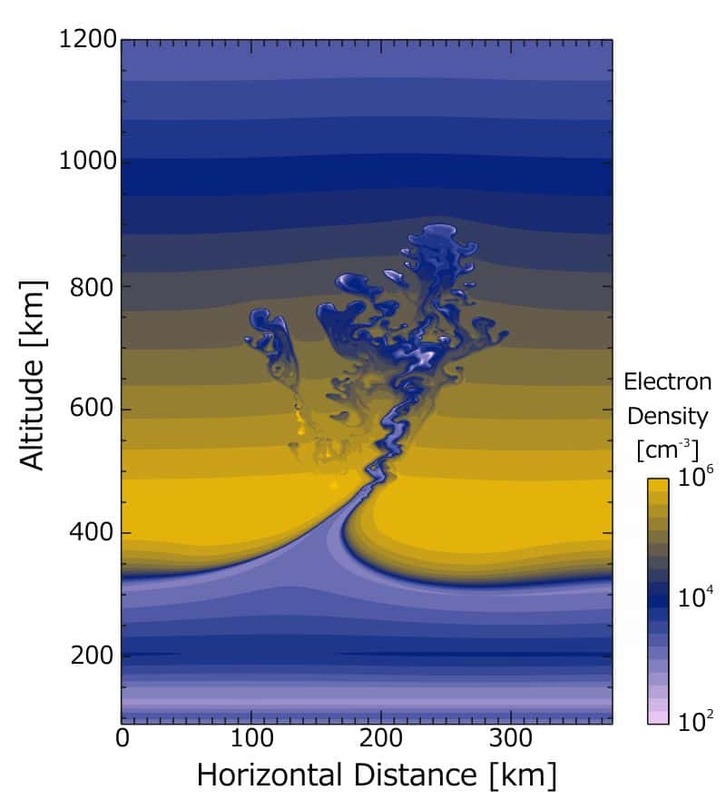 As shown in the figure, the ionosphere expands over an altitude range from 60 to 1000 km, and is divided into areas such as the D, E, and F regions from its altitude distribution. (Figure 1). These regions vary both temporarily and spatially in response to variations in solar UV intensity and in the state of the background neutral atmosphere. In the vicinity of Japan, the electron density generally becomes larger at lower latitudes. The electron density has regular temporal variations such as daily and seasonal cycles and the approximately 11-year cycle associated with solar activity. In addition to the periodic variations, irregular disturbances also occur. For example, immediately after a large solar flare, the "Dellinger phenomenon", an irregular increase in the D region electron density, sometimes occurs, which can disrupt radio communications. When the magnetosphere is disturbed, an "ionospheric storm" may occur, in which the F region electron density significantly increases or decreases. Some local fluctuations such as a "sporadic E layer" and "equatorial plasma bubble" also frequently occur in particular seasons. An "ionospheric storm" is a phenomenon in which the electron density decreases or increases significantly in the F region, where a large proportion of the electrons in the ionosphere are contained. It is known that the phenomenon occurs when a disturbance of the magnetosphere occurs and its influence is transmitted to the ionosphere via various processes such as through the disturbances in the state of the background neutral atmosphere (thermosphere) and in the electric fields acting on the ionosphere. 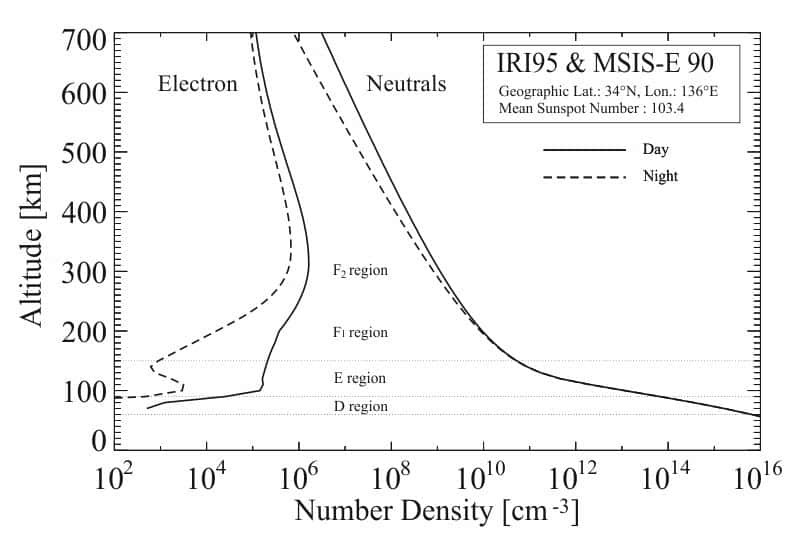 Figure 2 shows Earth's ionospheric state when an ionospheric storm occurs; the left and right panels correspond to "positive" and "negative" storms, in which the F-region electron density experiences a significant increase and decrease, respectively. Negative storms are generally caused by changes in the atmospheric composition after the polar thermosphere is heated and it expands towards lower latitudes. On the other hand, positive storms are caused by an uplift of the ionospheric layer due to the electric field that penetrates from the magnetosphere and to the equatorward thermospheric wind as a result of a magnetospheric disturbance. When a negative storm occurs, since the critical frequency of the F region decreases, radio waves normally reflected by the ionosphere are not reflected depending on their frequency. When a positive storm occurs, since radio wave propagation through the ionosphere is delayed further, the error of satellite positioning tends to become larger. The "Dellinger phenomenon" is a phenomenon in which the D region at altitudes of 60-90 km is abnormally ionized owing to a rapid increase in the solar X-ray flux after a solar flare eruption, which causes an irregular absorption of radio waves that are normally transmitted through the layer. The phenomenon is also called a "sudden ionospheric disturbance". The figure (called an ionogram) indicates an echo from the ionosphere observed by an ionosonde; the left panel shows an ordinary ionogram, while the right panel shows an ionogram when a Dellinger phenomenon occurs. When a severe Dellinger phenomenon occurs, HF radio waves are disrupted and a "blackout" may occur, and in worst cases, the disruption continues for several hours. The "sporadic-E (Es) layer" is a thin and high-plasma-density layer that sporadically appears at around 100 km altitude. It tends to appear in the daytime and evening in spring to summer over Japan. An intense Es layer reflects VHF radio waves and causes interference due to anomalous propagation. As shown in the right panel of Figure 4, the critical frequency is greatly enhanced when an Es layer appears. Neutral wind at around 100 km altitude plays an important role in the generation of the Es layer. The Es layer is a popular phenomenon among amateur radio operators because it enables long-distance HF/VHF propagation. Figure 5: Numerical simulation result of plasma bubble. A "plasma bubble" is an irregular and low-density region generated locally in the equatorial and low-latitude ionosphere. The color contours in Figure 5 show the plasma density distribution of plasma bubbles produced by numerical simulation. Plasma bubbles affect radio wave propagation from satellites to the ground and may cause communication outage and decrease navigation accuracy. Nowcasts and forecasts of plasma bubble occurrence are strongly required. Plasma bubbles usually begin to appear around sunset near the magnetic equator and propagate eastward having with structures aligned with the magnetic field. Plasma bubbles occasionally reach Japanese latitudes under high solar activity or geomagnetic storm conditions. The basic generation mechanism of plasma bubbles is already known, but it is still difficult to predict when and where they appear.